The view from Paul Wilhelm's Vagabond House. The pulsing spirit of this land! Paul Wilhelm (1909-1994) described himself as "a naturalist who lives in Thousand Palms Canyon" in the postscript of his articles for the Indio Daily News. 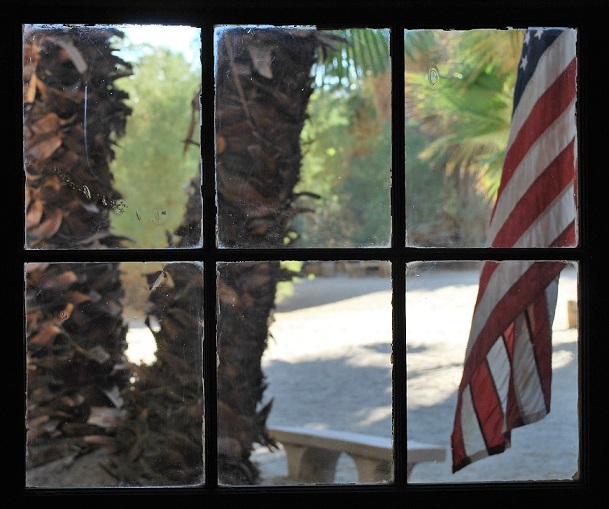 The plaque at the Paul Wilhelm Palm Grove dedicated to him reads, "This magnificent desert fan palm oasis is dedicated to the memory of Paul Wilhelm, desert writer, poet and naturalist. Paul devoted his life to the protection of these palms and the surrounding desert. Through his writings and conversations with visitors, he opened his arms and heart, passing on his deep love of the desert and its history for all who listened." It was the part about his being a poet that piqued our interest. 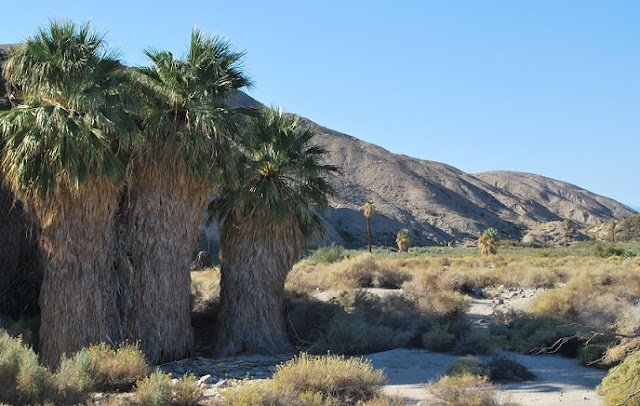 Wilhelm's father bought the Thousand Palms property Paul called home from the original settler at the turn of the 20th century to feed his livestock. The younger Wilhelm first set eyes on the oasis that would become his home when he was nine years-old and so began a lifetime love affair with the desert that was only interrupted by schooling and service during World War II. When we began to research Wilhelm and his poetry we expected to find a trove of bucolic poetry about the beauty and wonder of his desert oasis. And we were not disappointed. What we were surprised to find was one of the most brilliant poems ever written from the battlefield. The Street of Your Love impacts the reader on many levels and provides truth to the adage that there are no atheists in foxholes. Written in March, 1945 while Wilhelm served overseas in the European Theater of Operations, The Street of Your Love is respectfully shared at Veteran's Day. It was first published in the now defunct The Catholic World in December, 1945. "This 'God' — why, pah! — Now, a Pub's a PLACE." And gals — cheap talk — braggart ways —. And took it yard by yard. And me unscathed — ! To the top of the burning town. From a cellar's black slit-eye. Was certain over me — for the asking — ! And cleaned out two snipers busy there. Your Cross ablaze with light. "Excuse me, God," I said; "I believed their lies..."
Scattered beneath a bleeding tree. Where the widow lives, with the blind boy and his doves. The shell-pocked door was barred; so I knocked. "O.K. in there?" All was still. "O.K.?" I said. A cry — a sob — . "Merci, Monsieur — merci —!—"
Until I came upon her easement. Her eyes full of night, and stars. "My pet goats kiss your hands, Monsieur..."
That I was afraid of before. The "zero hour" — we're moving up. I'm glad I met You — God — today. Why I'm not afraid now —. God — I know You'll be waiting there! It is against this backdrop of war that Wilhelm would later recall that, "During the Battle of the Bulge in Belgium, my brother Pat wrote that he had been out to see the oasis; "Part of it has been vandalized. But the main thing is that Dad has passed on and he has left the 80 acres to you."" Hurtgen, in the poem, refers to The Battle of Hürtgen Forest. Fought along the border of Belgium and Germany, The Battle of Hürtgen Forest was the longest battle on German soil during World War II. It is to this day the longest single battle the U.S. Army has ever fought with casualties to the U.S. First Army numbering at least 33,000 killed and wounded. Famous for it First World war battle, Verdun, France was heavily bombed by the Germans after its liberation by American forces in September 1944. Battles in "the bloodsmeared Normandy hedges" that Wilhelm writes about has been described as, "risky, costly, time-consuming, fraught with frustration. It was like fighting in a maze. Platoons found themselves completely lost a few minutes after launching an attack. Squads got separated. Just as often, two platoons from the same company could occupy adjacent fields for hours before discovering each other's presence." The cathedral in the Ardennes hills could refer to the Collégiale Notre-Dame in Dinant. The area described in Wilhelm's poem came to prominence during the Battle of the Bulge in December 1944. Allied forces blocked the German advance on the river Meuse at Dinant. When he returned home to his Vagabond House following the war, the self-described "desert rat's poet," devoted his life to the preservation of the desert he called home and the people, plants and animals who inhabited his environs. The poem that appears at the beginning of this piece is entitled, Whispered Music and appeared in the July, 1949 issue of Desert Magazine.